China will likely see an increase in the prevalence of lung cancer among its population over the next five years, the state-run China Daily reports. Medical experts told the paper that over 800,000 annual diagnoses and 700,000 annual deaths can be expected by 2020. China already has more lung-cancer diagnoses and fatalities than any other in the world, with 600,000 dying of the disease every year. Around 700,000 Chinese have been diagnosed with it this year. The problem has been mounting in recent years as the country’s air pollution goes largely unmitigated. China remains the world’s largest consumer of tobacco products — a study earlier this year estimated that 1 in3 of all young Chinese men will die of tobacco-related illnesses — though experts say pollution will replace smoking as the primary cause of lung cancer. 1. The problem has been mounting in recent years as the country’s air pollution goes largely unmitigated. 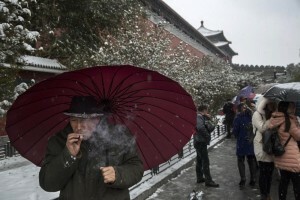 What do you think the reason why China increase the number of lung cancer Patients? 2. Aside from lung cancer, what do you think the other cause of smoking?